> 1. What programs do you run? Children’s Basic English, Adult’s Advanced English, Library, Children’s Art, and English classes at Técnico del Valle (a local technical school). > 2. If you had to pick one, which is your favorite and why? Probably Adult’s English. It’s nothing against the kids, but all of my adult students are in class of their own accord. They are very motivated, inquisitive, and we often fall into some interesting class conversations about such things as religion, politics, education, and about which Ecuadorian beer is better: Pilsener or Club. > 3. How did you hear about Manna and what made you want to join? I heard about MPI through Worcester State University. As part of WSU’s alternative Spring Break program I was a one-week volunteer for MPI Nicaragua. My experience there was extremely enjoyable and I decided to apply to be a 13-month PD upon returning to the States. The things about MPI that I drew me in the most were the extended cultural and linguistic experiences, the potential to form life-long friendships, and the personal autonomy of the Program Directors, who are free to reshape already established programs to fit their own styles/personalities and even to create new programs given the opportunity and resources. > 4. Is there something from your experience so far that has caught you off guard? A couple of things that rub me the wrong way are when people stare (unashamedly and for uncomfortable periods of time) at any of us gringos like we’ve got two heads, and the oftentimes sickening chauvinism of machismo, i.e. when men (most of whom use extremely questionable amounts of gel in their hair) catcall at women, whistle/hiss at them, and make snide remarks, all while feeling entitled to act so disgustingly. > 5. Who's your favorite child in the Library….they'll never know? There isn’t one kid that immediately jumps into my head as a clear favorite. Gaining the trust of a bunch of different kids and becoming friends with them has been really rewarding. There are certainly some kids who I will miss more than others when it comes time to leave, but as I said, I don’t have one specific favorite. > 6. What is your favorite meal to cook? As is known quite well throughout the house, I’m not exactly Top Chef… but I do my best. So while my cooking skills leave much to be desired, I guess my favorite meal to cook is my favorite one to eat: chicken, mashed potatoes, boiled broccoli, green beans, and corn bread. > 7. Who's your favorite band? Currently it’s Johnny Flynn and the Sussex Wit. > 8. What's cooler: The Choclo or the Monument de Ruminahui? Why? I prefer the Choclo. It’s much more colorful and inviting. The unfortunate fact that the Monument of Rumiãhui has been fenced off from public use due to (from what I’ve been told by our neighbors) an excess of drug trafficking and violence in the past makes it much less of a draw… If they took down the fence and made the Monument a nice place to sit down, read a book, and relax, I might change my mind. > 9. Where's your favorite spot to cuddle with Gandalf? Gandalf and I do not hang out, let alone cuddle. We simply co-exist. Neither he nor I expect any kind of thawing in our relationship before August 7th when my contract ends. > 10. What do you think is the best thing you will take away from your experience with Manna? Friendship! It’s been a year full of good times, cool challenges, and fantastic people. > 11. What impact do you hope to leave on Manna? I haven’t thought much about this one. The hard part about spending 13 months living and working in a new place is that it’s long enough of a time to develop lasting bonds and memories, but it’s still quite a short period in the grand scheme of things. Our contract ends, we are replaced by new PDs, and we ourselves become nothing more than a memory here in the Valley. If I’ve managed to bring positive energy and laughter to MPI then I’m satisfied. > 12. How will the death of Venezuelan president Hugo Chavez affect Latin America? Will his pronounced successor Nicolas Maduro win or will Venezuelans choose a different way forward? I assume that Maduro will win if only because he’s got Hugo’s political machine behind him, and Chavez himself told his supporters to back him… that should be enough for him to win the special election. It’s been interesting to see the reaction to Chavez’s death here in Ecuador. Most of the sentiment towards him (from what I’ve seen) is positive. He’d done some really good things for his country (nearly eradicating illiteracy, upping social spending, decreasing the country’s overall poverty percentage, etc.) and he’d also done some not-so-good things, too (censoring the media, limiting opposition input, and while he has lowered the poverty rate, it still remains very high). As a nationalistic, charismatic leader, I think spiritually he has provided a boost for Latin America. As a strong-handed politician, I think he has only perpetuated a long tradition in the region of too-powerful administrations with dictatorial tendencies. One of the best parts of having Spring Breakers come down is that we get caught up on what's been going on in the US while we have been in Ecuador. Word of the "Harlem Shake" phenomenon reached us first from Polly's parents, but we got to hear more about it last week... and to join in on the fun ourselves! Please enjoy this video, created with love by Polly Colgan and starring the Ecuador PDs and Vandy Spring Break groups! And enjoy these pictures from the Vandy group's library party on Friday. See more pictures and read about their experience here! Check out the posts by our two new groups of volunteers from UGA and Duke. Spring Break is here! Which for MPI-Ecuador means 2 great volunteer groups from Vanderbilt University and 24 extra mouths to feed. Check out their blogs throughout the week as they post about their experience volunteering in our Community Center and with our Microfinance Program. 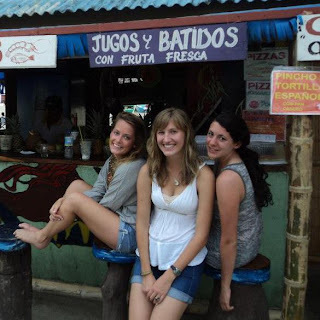 Click on the Vandy Microfinance 2013 tab to read the latest from the group! 1. What programs do you run? Children's English (I teach Advanced), Children's Nutrition, Preventative Health Center (this includes teaching Nutrition for the Sangolqui Association for Diabetes and Hypertension), Teen Center, and Women's Exercise (I teach Yoga). 2. If you had to pick one, which is your favorite and why? This question is too difficult! I love all of the programs, but especially the health related programs. Kids nutrition is taught at a nearby public school and while teaching over 100 6th graders is challenging it is the most rewarding of all my programs. Teaching yoga is amazing because of the dedicated students that come to every class and I can immediately see how the class has impacted them by their relaxed, smiling, faces after practicing. Lastly, PHC is an incredible program because it is extremely broad and has so much potential. I am able to shadow Doctors through this program and help elderly women with Diabetes learn about nutrition. It gives me incredible opportunities to see public health in action. 3. How did you hear about Manna and what made you want to join? My sophomore year of college I wanted to spend a couple months out of my summer volunteering in South America in order to learn more about public and international health as well as improve my Spanish. Over winter break I was out to lunch with my best friend and her family and was telling them about my hopes of finding this sort of opportunity. Lucky for me, a former Ecuador PD, Abbie Foust, was there and told me all about Manna. I applied to be a summer volunteer in Ecuador, and after my summer experience could not wait to apply to be a PD! 4. Is there something from your experience so far that has caught you off guard? I never thought I would be growing so much personally through this experience. From feeling like a stranger in a place that is my home to learning how to live and work with a group of people I didn't know before coming here, I have learned so much about courage, communication, compassion, and other very important life skills I never expected to learn. 5. What's your favorite place in Sangolquî? There is a park across from the Sangolqui hospital and at the far left part of the park is a Pine Tree grove and a little dirt path. Whenever I walk through it reminds me of home. That place and of course the Sangolqui center (with an ice cream cone in hand). 6. What is your favorite meal to cook for dinner? Anything delicious and vegetarian. If it has beans, chickpeas, quinoa, lentils, or veggies and a lot of spices, I love it. 7. Who's your favorite band? I can not possibly name a single group. I like almost all kinds of music (minus Country) and have a soft spot for female vocalists. Some consistent favorites are Iron and Wine, Sufjan Stevens, Grimes, and Rilo Kiley. Also while living here I have developed an embarrassing love for Reggaeton, especially Daddy Yankee. 8. What it your most cherished experience so far with our neighbor Cesâr? One day Janine and I were going to a nearby health center and Cesar offered us a ride. The trip lasted about 2 hours and included us visiting a nearby military base and getting to see helicopters take off and land about 20 feet away. It was actually pretty cool. 9. Tell us how your really feel about our cat Gandalf? I love him so much. I really, really, do. Its just so hard to love him though since he is a cat and doesn't care about my existence! It is SUCH a one-sided relationship. Also I do find him extremely annoying when he non-stop meow's at me until I feed him. I am also very bitter that he refuses sleep in my bed. Maybe this is too much information? 10. What do you think is the best thing you will take away from your experience with Manna? As I mentioned before, I have learned so much about who I am as a person and grown from this experience. I have also gained an a perspective on life I never knew before - something that I think naturally happens from living in a new culture and in a new country. I feel like the one thing I will take away (and hope to take away) from Manna and be able to use the rest of my life is a greater sense of empathy and trying to fully understand the experiences of other people. 11. What impact do you hope to leave on Manna? I hope my students have learned something - whether it is how to conjugate "to-be" in the past tense or what a whole grain is - and I hope that someday that knowledge may help them. I hope that I somehow helped someone by being a resource a friend, or just a "profe". Overall, I hope that by me being here I have helped improved a community member's life, even if it is in a small way and only for a few people. 12. Do you think the recent re-election of Ecuadorian President Rafael Correa is a good thing for the country? Do you think he is just another example of the long tradition of machismo, political bosses that have ran South America over the last century? Will he step down after this six-year term like he says he claims he will? 13. Why do you think no one replied to our request for questions to ask you? Because no one reads the blog. Just kidding Pete and Jeff! I read it!